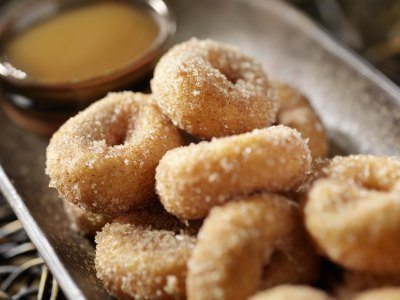 Sugared Cinnamon Donut from Goose Creek sounded like a scent I would enjoy. I love warm doughy scents and that’s what I imagined this candle to smell like… a warm doughy bread smothered in butter with sugar and cinnamon. YUM!!!! 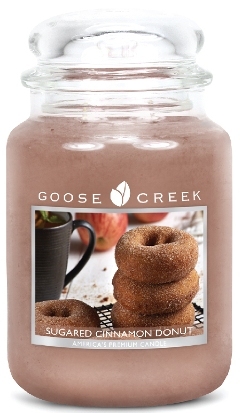 A mouthwatering mix of cinnamon sugar, vanilla bean, and raw sugarcane poured over a warm homemade donut for an ultimate, fresh baked scent. First impression when I popped off the lid… I smelled a warm cinnamon bakery. Not sure on the doughy part which I would have liked but it did smell yummy. The wax smelled like a warm cinnamon bread. Very comforting. Let’s see how this candle performs! I decided to start this candle in my master bedroom to test out where it stayed till the very end. Once the wicks were lit, it took the average 20 minutes to reach a full melt pool and the aroma was just as it smelled cold… a warm cinnamon bakery. I still wouldn’t say this candle smelled like a donut because it lacked that doughy component I expect from that type of scent, but it was still a yummy fragrance. I’m sticking to a warm cinnamon bread. Strength – this candle gave a decent scent throw in a really large room. I was happy. I would rate it an 8 out of 10 in a large room. 10+ in medium to smaller rooms. This candle burned pretty decent, I just had to stay on top of wick trimming. The flames easily became torches if I didn’t. Because of that, the glass did blacken a little bit but that was due to not trimming the wicks enough. A good reminder to always watch your burning candles. Sugared Cinnamon Donut from Goose Creek was a nice cinnamon bakery and I did enjoy it. Would I purchase it again? Yes. It smelled very warm and comforting. Had it had more of that doughy component I was hoping it would, I would have been in heaven, but alas… it wasn’t meant to be. Don’t let that stop you though… if you love warm cinnamon bakery scents, give this candle a whirl. You may fall in love.